Great news Potterites! 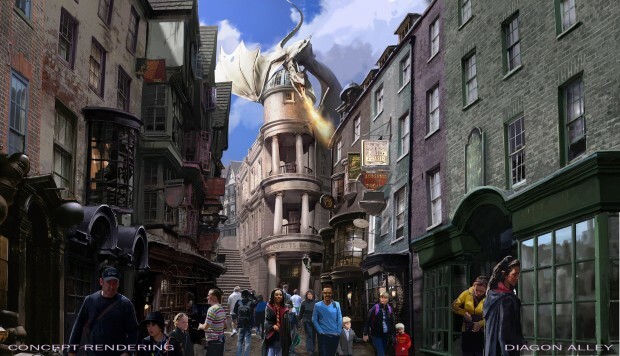 Universal Orlando Resort has revealed some exciting new details about The Wizarding World of Harry Potter – Diagon Alley. The expansion will double the size of the area already dedicated to Harry Potter at Universal Orlando, expanding it across both Universal theme parks. 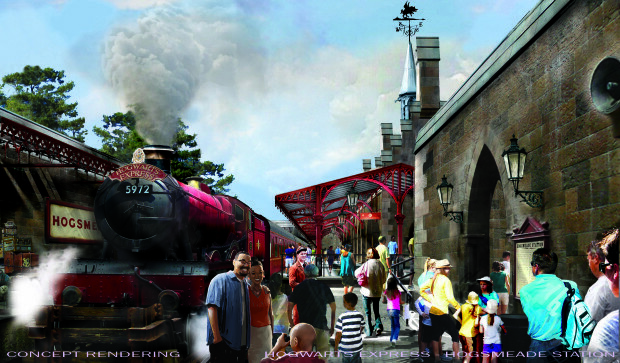 Universal Orlando launched The Wizarding World of Harry Potter – Hogsmeade at its Islands of Adventure theme park in 2010. 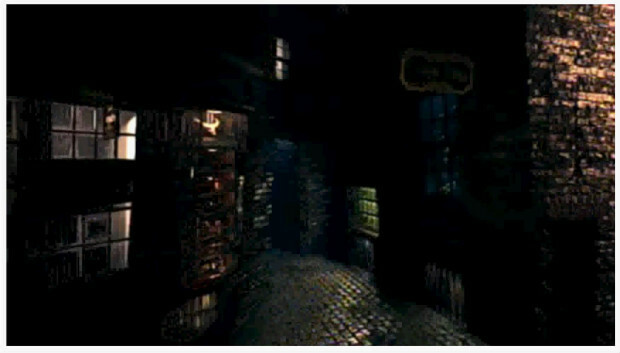 Diagon Alley will be located within Universal Orlando’s other theme park, Universal Studios, and will create new experiences based on the signature areas of London, Diagon Alley and Knockturn Alley. 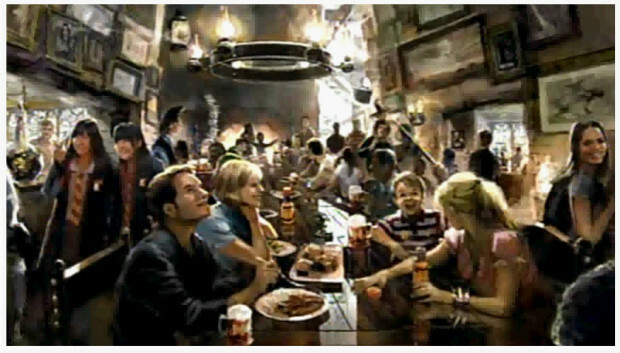 Universal’s creative team has been working closely with Stuart Craig and the production team from the Harry Potter films to make the new area as authentic as possible, just as it did with Hogsmeade. 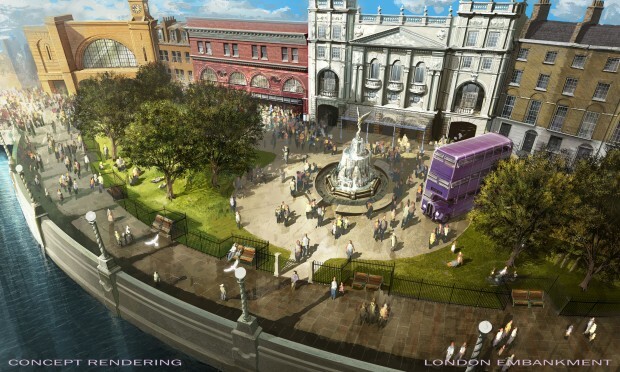 The vision for Diagon Alley is unprecedented, with Universal Orlando creating the world’s first centrally themed, multi-park experience. After arriving at King’s Cross Station aboard the Hogwarts Express, guests will pass through London and the iconic brick wall archway from the films into Diagon Alley, a bustling, wizarding hub within a Muggle city. There will be shops, dining experiences, and a new ride called Harry Potter and the Escape from Gringotts, a multi-sensory, multi-dimensional high-speed thrill ride that will take theme park attractions to a new level. Board the Hogwarts Express and journey between London’s King’s Cross Station (located in Universal Studios Florida) and Hogsmeade Station (located in Universal’s Islands of Adventure). The journey will be filled with views of London and the British countryside, as well as a few surprises. Each leg of the Hogwarts Express will be unique. Park-to-park admission is required. Experience a groundbreaking new, multi-dimensional thrill ride, Harry Potter and the Escape from Gringotts, which will place riders in the middle of an incredible adventure as they navigate their way through the perils of the Gringotts vaults. Guests will walk through the bank’s grand marble lobby where they will see goblins hard at work. Bill Weasley will be featured, explaining things to guests. Guests will then take a high-speed journey through cavernous passageways that lead “deep underground”. They will encounter Harry, Ron, and Hermione along the way. Discover the darker side of magic in Knockturn Alley, the darkest of dark places that features Borgin and Burkes, a shop specializing in the Dark Arts that will offer a wide variety of dark objects, such as Death Eater masks, skulls, and other sinister items. 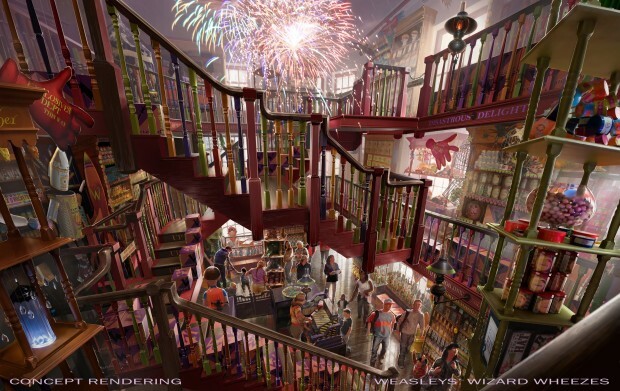 • Weasleys’ Wizard Wheezes, a vibrant shop featuring novelty items, magical jokes, and toys inspired by the books and films that will amaze the mischievous child in everyone. • Madam Malkin’s Robes for All Occasions, where guests will find a variety of wizardwear from Hogwarts school uniform ties, scarves and jumpers, to authentic wizard’s robes and character costumes. • Magical Menagerie, which features a collection of plush animals, such as owls and Hippogriffs. 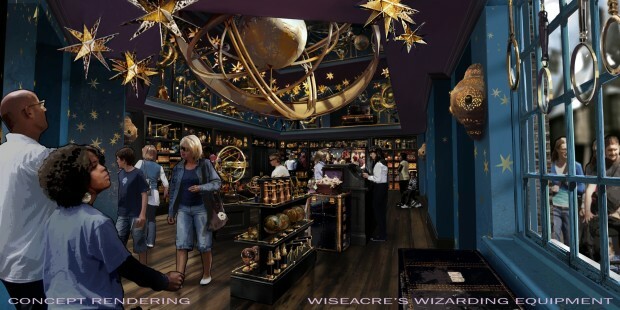 • Wiseacre’s Wizarding Equipment, where guests can grab wizarding essentials such as telescopes, binoculars, armillary spheres, compasses, magnifying glasses and hourglasses. • Quality Quidditch Supplies, offering a wide assortment of apparel and equipment including Quidditch sweaters, brooms, Golden Snitches, Bludgers, Bludger bats, Quaffles and more. Enjoy traditional British fare that includes favorite dishes such as fish and chips, bangers and mash and more at the Leaky Cauldron. 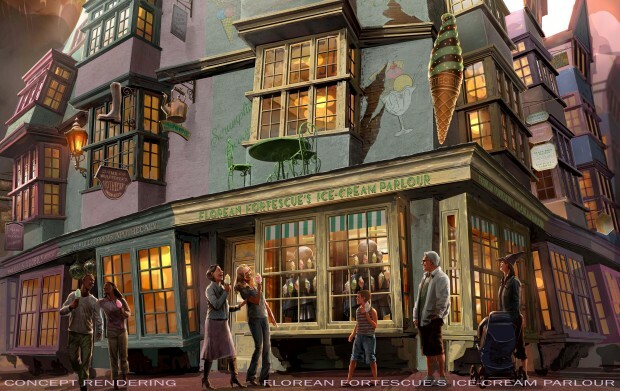 Visit Florean Fortescue’s Ice-Cream Parlour for frozen treats in a variety of tantalizing and unique flavors such as strawberry-and-peanut-butter ice-cream and many others. As part of the expansion, Zonko’s Joke Shop in Hogsmeade will be closing to make room for an expansion of Honeyduke’s. The stationary Hogwarts Express locomotive will be staying at its current spot in Hogsmeade. No opening date was announced, but more details about the experiences that can be found in Diagon Alley will be released over time. 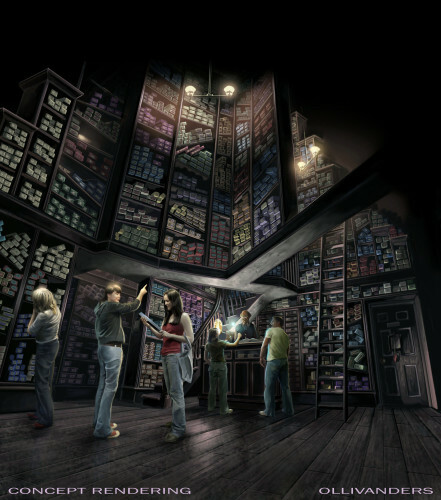 For more information about the area, visit UniversalOrlando.com/HarryPotter. Article Courtesy of OrlandoAttractions Magazine.